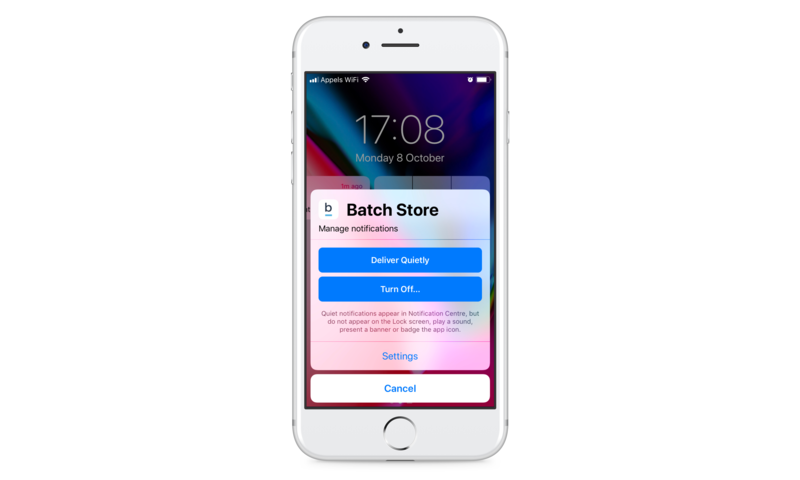 Starting from iOS 12, users can go directly to the settings of your app from a push notification to disable specific types of alerts. Starting from iOS 12, users can disable notifications directly from a notification by sliding the push and tapping the "Manage" button. By default, iOS will direct your users to the system settings. 1. “Deliver Quietly”: iOS will disable the notification sound and vibration. the notification will show up in the notification center only. By default, iOS will disable notifications. If your app supports advanced push settings, iOS will show an additional button in the confirmation prompt, allowing users to disable specific types of notifications in your app, rather than fully disabling them. 3. “Settings”: Opens the standard notifications settings for your app. If your application implements advanced notifications settings, an additional button will show up to redirect the user to your app for more settings. How to add this feature? Note that this still requires you to implement a UNUserNotificationCenterDelegate, and the appropriate method to open the settings.